Are you having A to Z Challenge Flashbacks? FYI: I'm still catching up on other writers' blog posts so please bear with me, people! First, you'll note the blog's new look. I'm still playing around with the color scheme but I'd like to thank the lovely, talented and amazing Carrie Butler for my blog header! Also check out my website to see the photo/slogan she did for my header over there. As congratulations for signing with my new publisher, Carrie graciously volunteered these and I have been in love with them ever since! (Also check out Nancy Thompson's blog cause she helped over there too and it looks incredible!) Thanks, Carrie. You are the best! There are a few things I wanted to talk about in this post. First of all, last month I read the Hunger Games Trilogy. Not because I had any interest in it but just because I couldn't stand not being in the loop one second longer. I had to see what all the hoopla was about. I never read the Harry Potter books and I never read the Twilight books. I did read the first few chapters of Twilight but never got much further than that. This time I vowed that I would know what the hell everyone--and I do mean just about every single person I know, even people who don't usually read--was going on and on about so I read the first book, not even intending to read the others. Well, if you've read them then you know that Collins has made it impossible not to read the other two books. In my estimation, the hoopla was right on the money: the books were entertaining and provoking. The writing was clean and smooth. The characters were amazing and I was pretty instanteously attached to them. Probably more than anything else, I dug the strong female protagonist. My point is that I actually know more adults than kids who loved these books. Just like I knew more adults than kids who liked Harry Potter and Twilight. For a long time this has bothered me. I mean what does that say about people who actually write for adults? Are we doing something wrong? Are we not fulfilling our writerly duties that adults would rather read YA fiction than adult fiction? Are we not compelling enough? Are our stories flat and uninteresting? What if Twilight had been pitched and marketed as an adult series? (Yes, I know, I know, there were teenaged characters in it, as there were in the Hunger Games, just suspend your disbelief for five seconds). Where would it have ended up? In the paranormal romance genre? What about Hunger Games? Fantasy? Would either one of these series have gained such a massive following? I doubt it. I really think there is a market out there that publishers are not targeting directly. Adult readers of YA fiction with adult themes. There are a group of writers, however, who have their fingers on the pulse of this market. They're calling the genre New Adult fiction (so yeah, we're talking college age protags really, not necessarily teenagers but you know, some of the most interesting stuff in my life happened to me at college-age. Don't know why no one wants to read about characters in this age group!) and their new website and blog is NA Alley. Anyway, the wonderful Carrie Butler is a part of this group and I urge you to get over there and check it out and to support these writers. I, for one, have had the privilege of critiquing for Carrie and I can tell you that I would definitely camp out overnight wearing a tee-shirt with her male lead's likeness on it just for a signed copy of her book. And I'm not typically that kind of reader. It would be a shame for all this crazy talent to go to waste just because publishers think adults don't want to read about people who aren't 30 yet. Finally, two more things: another brilliant writer/blogger, The Doubting Writer (Jeff O) has a short story called The Prophet posted here which blew my mind. Get over there and read it now! You will not be sorry! 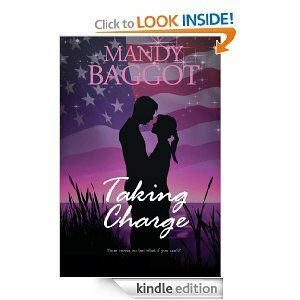 Last: my fellow Sapphire Star Publishing author, Mandy Baggot released her novel last week, Taking Charge. It's a romance novel that sounds like a really fun read! I can't wait to read it myself. You can check that out here. Look at this spiffy new blog! Thanks for the shout out, Lisa! Your blog and website both look amazing! I can't believe what Carrie has done. She truly is amazing. I've had nothing but wonderful feedback on the new look of my blog and the work Carrie did for me. She's incredible!! I've only read the the first in the Hunger games trilogy and I want to read the second, but I'll probably pass on the third. You aren't the only one I know who's said that. I joined NA Alley and I LOVED Carrie's book, Strength. I'll be camping out with you in your tent for a signed copy! And I agree that publishers aren't tapping into a huge resource. That said, I can't imagine my son having time to read for leisure while in college attending class. But those of us adults who read books for a younger audience, well, that's a different animal entirely and the pubs are fools not to tap into that. I read Jeff's short story and was SHOCKED by the ending. I never saw it coming. He is so extraordinarily talented. I love his style. And I bought Mandy's book. It's waiting for me on my tablet. Hah! If I ever got lucky enough for that scenario to play out, I'd come sign your books first. ...And anyone in a 10 mile radius. Where, oh where to begin? Well, thanks for the shout out--I appreciate it, glad you liked the story, and I think the folks at the Smithy will love the traffic. It's a great little place that does a lot for the arts in our community. Next, love the new look. Eerie. That Carrie, she does nice work. I'm a teacher and the parent of a tween/teen so I know plenty of kids who love HG. But you raise an interesting point, one that publishers are puzzling over right now...the whole crossover appeal. As good parents, we want to read what our kids are reading, right? So HG and HP are like great Pixar movies bc they appeal to most ages. The bigger age-range appeal your book has, the better chance it has in the market. This is why movie producers try really hard to get a PG-13 rating rather than an R - broader appeal. Great new look for the blog. And thanks for the NA Alley scoop. I'm off to check it out! Love the new header. The blog looks very spiffy now. I enjoyed the Hunger Games trilogy, though I was one of those who was disappointed by the third book's ending. It is amazing how many adults are hooked on these YA books, and I think you bring up a really interesting point about the adult market missing out on some key storytelling element there. I'm a big fan of the Hunger Games trilogy - have read all three books twice now, something I never do. Dang, it looks good in here! Great header!